There is nothing more satisfying than solving a problem. This morning, Hugo was standing on the edge of Structure Fourteen, contemplating the complexities of the building which faced him. Then, a “eureka moment” arrived. A robbed-out wall line, which had caused some head-scratching, suddenly clarified itself as a pier and walling opposite this as the end wall, rather than a side wall. This shifted the whole axis of Structure Fourteen around. Instead of running north-west to south-east, it now is clearly seen to be running south-west to north-east. The implications of this sudden realisation are momentous. What seemed to be a collection of ephemeral walls, and probably later in date than the other main structures on the site, can now be seen to be similar to Structures One, Eight and Twelve. It also respects Structure One – in other words, it is separate from Structure One and does not interfere, in any way, with its walls. This means two things, principally. Structure Fourteen may be contemporary with these other main structures and can thus be placed firmly in one of the major later phases of the site, but probably before Structure Ten. It also means that it may share the same architectural elements as Structures One, Eight and Twelve, and this, in turn, suggests that it might share their size. From initially wispy walls, Structure Fourteen can now be seen as possibly representing a building perhaps ten metres wide and over 12 metres long – if it is as symmetrical as one, eight and twelve. Although the walls have, in part, been badly robbed out, we can now see other architectural features it shares with one, eight and twelve, apart from the use of piers and extremely fine angular masonry. The main wall consists of two separate elements – a double-faced inner wall, with an outer revetting wall, and a midden core between the two. Perhaps we’ll just have to extend the trench again to see the full extent of this building! Truly, the Ness never ceases to astonish. But things got even better in the afternoon. Vince has been rooting around (in an archaeological way, of course) in the robbed out remains of the outer wall on the eastern side of Structure Fourteen. His patience was rewarded when, what looks very like, an entrance to the building emerged. This is definitely the icing on the Structure Fourteen cake. In Structure Eight, the heroic work of removing the last roof slates, perhaps numbering around 300 so far, is continuing. In the southern area, where the rubble and midden infill is being removed, what looks very like a bench setting, along the inner face of one of the recesses, has also been revealed. Meanwhile, in Structure Ten, Claire’s work in the small recess, where there is evidence for pigment production to one side of the dresser, has revealed a truly enormous flagged floor. One huge flag, some six feet by four feet, fills the entire area of the recess, and there are indications of an even bigger one underneath that seems to support some of the walls of the recess. It might have been reasonable to expect the main floor area in the centre of such a magnificent structure to be flagged. Instead, we have a flagged recess for reasons which are not yet clear. Claire, beavering away in the pigment production area in Structure Ten, reveals the massive flagged floor. Mike’s trench over the area where the suspected entrance to Structure Ten is located, is also paying dividends. Like many of the walls in this magnificent building, it has been robbed out and only a series of robber cuts survive, which are filled with the detritus of that robbing. 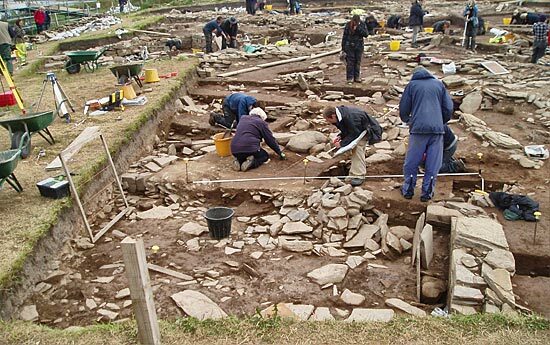 However, several slabs are now coming to light that may indicate the surviving basal courses of the entrance passage that seem to point exactly due east, towards the equinox sunrise and Maeshowe. Lets hope he can fully define it. Time will reveal the answers, but we have only one more day of Week Three before the weekend, and quite unnecessary rest and recreation, intervenes. Hello! My name is Jason Henry. I am one of the students from Willamette University in Salem, Oregon, USA, participating in this year’s excavation and field school. This summer, I needed to complete a field school to finish my BA in archaeology at Willamette. 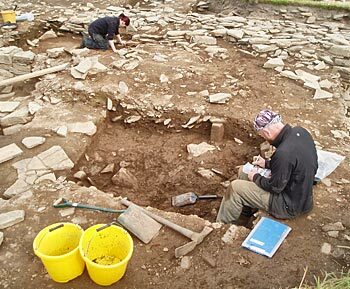 I chose to come to the Ness of Brodgar excavation after seeing Nick and Jane present on campus over the past of couple of years. Their presentations were outstanding and, once Willamette set up a field school at the Ness of Brodgar, I wasted no time in turning in my application. On site, I have been excavating, mostly, in the central midden area and Structure Eight. The excavation has been going great and I have been doing a lot of trowelling for the most part, with the exception of a small finds recording day. 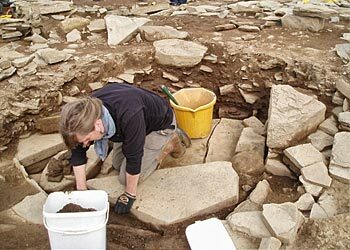 Excavation is one of my favorite things to do, so I have been enjoying all of my time on site. 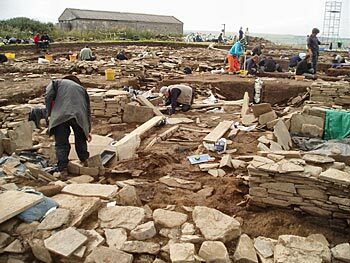 The Ness of Brodgar site itself is so complex and interesting. I have never had the opportunity to before excavate at site that has walls, let alone a site of this calibre. It has truly been an amazing experience. Today is actually my last day at the excavation. I begin my travels back to Oregon tomorrow afternoon. Once home, I will continue to pursue archaeology as I begin a MA program this fall at Oregon State University. I want to say a quick thank-you to everyone on site for making my experience at the excavation as fun and enjoyable as the last two weeks have been. Thank you!